Eating with the seasons makes you appreciate certain ingredients all the more since they are at their peak for such a short time. Corn is one of those things that really speaks summer to me. 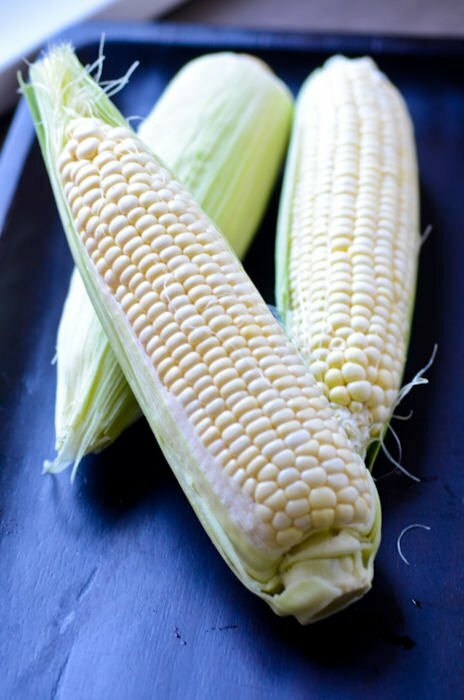 I love the taste of summer corn, when it’s fresh and in season it doesn’t need much to highlight it’s sweet clean taste. 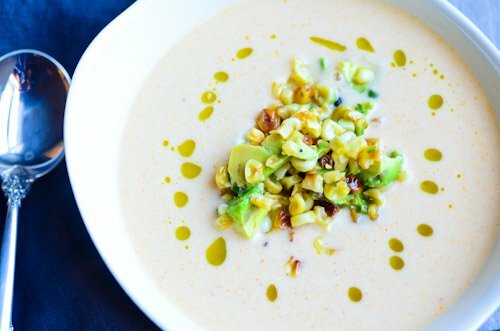 In my experience most corn soups have too many ingredients, the corn gets lost behind layers of bacon and heavy cream. 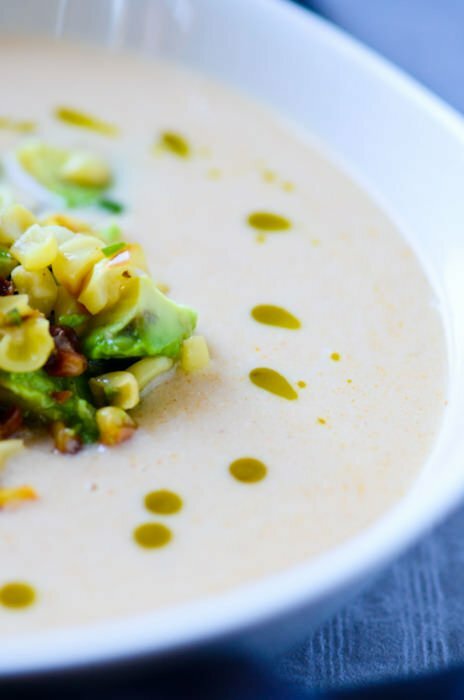 I wanted to create a soup that allowed the flavor of the corn to really shine through. Don’t be discouraged by all the separate components, you do need to start the cashew cream the night before but only takes a few minutes to prepare and really adds a nice creaminess to the soup and the whole thing comes together quickly. 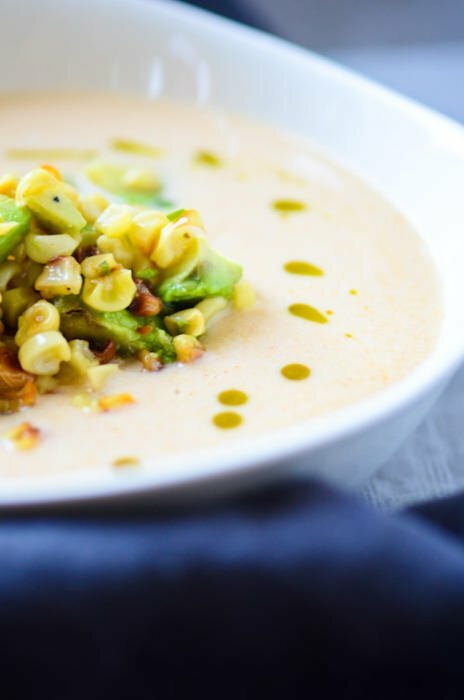 The roasted corn guacamole is nice and bright and the perfect topping for this refreshing summer soup. You can use leftover basil oil in an infinite number of ways. It’s delicious drizzled over eggs, makes a great base for salad dressing and can add a nice punch to vegetables. 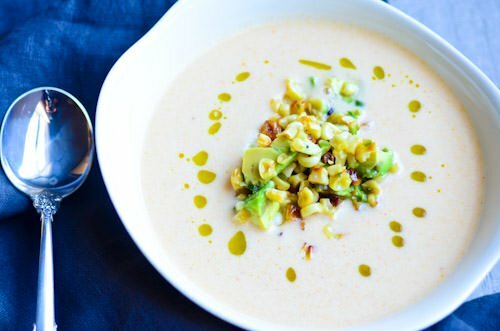 This dish is completely vegan but if you don’t want to make the cashew cream and don’t care if it contains dairy you could substitute a 1/4 cup of heavy cream for the cashew cream. Soak the cashews overnight with enough water to cover by an inch. Let sit 8 hours or overnight. Pour the mixture into a blender and blend for 3 minutes until you get a smooth creamy mixture. Blanch the basil leaves in boiling salted water for 10 seconds and then immediately put them into an ice bath. Squeeze the excess water from the basil and then blot on paper towels. Put the basil in a blender with the oil and puree until the basil is finely chopped. Strain the mixture through a fine sieve and set aside to let the flavors develop while you finish the soup. Extra oil can be kept in the refrigerator for up to 10 days. In a dutch oven or large pot heat the olive oil over medium heat, add the onions and cook for 4-5 minutes until they are translucent but don’t let them brown, add the garlic and paprika and cook for an additional 2-3 minutes until the mixture is fragrant. Cut the kernels off the cob into a bowl and using the back of your knife scrape the cobs to release any additional corn “milk” Add the cobs and 3 cups of the corn and 2 quarts of water to the pan. Cook the mixture for 15 minutes uncovered. Remove the cobs from the mixture and in two batches puree the mixture in a blender until smooth. Strain the soup through a fine sieve, pressing on the solids to extract as much liquid as possible. Whisk in the cashew cream, taste and adjust the seasonings if necessary. Pre-heat the oven to 450 degrees. Line a baking sheet with parchment or aluminum foil. Put the corn kernels on the baking sheet with the tablespoon of olive oil, 1/4 teaspoon of salt and black pepper to taste. Roast the corn for 20 minutes until the corn is golden brown and caramelized. 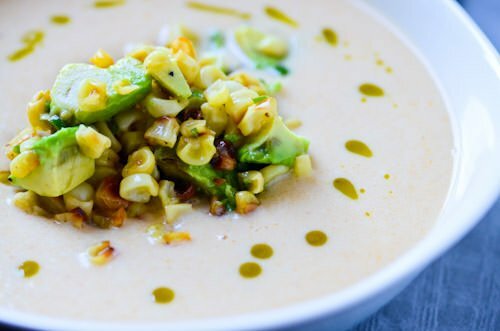 To finish combine the corn with the jalapeno, lime juice and avocado and toss gently. 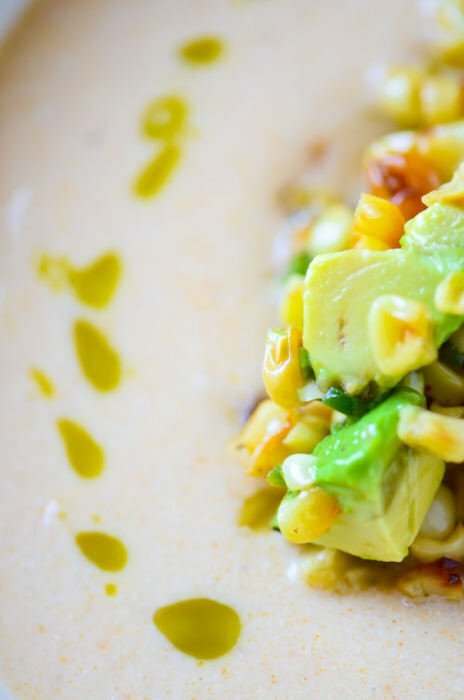 To serve, ladle the soup into bowls, top with the guacamole and drizzle with the basil oil.